in the frame of the action Hosting Moderna Galerija! Years of (non)policies have proved an existential threat to the basic infrastructure and intellectual and creative work in the field of visual art. The city and the country are downgrading the visual arts relative to other fields of artistic production. Contemporary visual art has long exhibited the characteristics of total art, and for several decades now the discourse of visual art has extended well beyond the notions of classic techniques, tools and means of expression. Contemporary art includes performative, non-gallery, conceptual, contextual and traditional art practices and dimensions, and does not differentiate between 'new' or 'old' media. The effects of malnourishment, which threatens to drastically decline activities or even result in close-downs, can be seen in all spheres - production, interpretation, presentation, education, theory, documentation, archives, research, counselling or promotion. The major international contemporary visual arts events, such as documenta, the Venice Biennale, Manifesta and others are closely connected with the Moderna galerija, public institutes, galleries, freelance artists and NGOs, all of which represent a solid basis, with well-developed international networks. To express support for the Moderna galerija and its endeavours to secure better working conditions during renovation, we have been organising activities which aim to mitigate the negative effects that the suspension of the gallery's activities have on modern and contemporary art. Our activities are also an appeal to institutions and individuals working in the field of contemporary art to establish a networking platform to facilitate easier communication and collaboration. Moderna galerija (Museum of Modern Art) is the Slovene national institution for modern and contemporary art. As a museum of Slovene modern art it explores and presents the 20th-century Slovene art tradition, while as a museum of contemporary art and exhibition venue it presents new art practices and their context. Moderna galerija began to assemble its media art collection in the late nineties, a time following major local and political changes. Until than its purchases of video and installation works were infrequent and unsistematic. The purpose of the collection is manifold: constituting works mainly by Slovene video artists, it means that the Museum of Modern Art has created a new dimension to its activities, i.e. it wishes to present media art, which has been overlooked until than, to establish a dialogue between traditional and media artists and in this way create a new, different view on the development of art in the second half of the twentieth century. Although the collection is small, it do has many examples of both video and installation art, and it shows this type of work regulary. They have included net art in several group exhibitions oriented toward contemporary trends. The collection already comprises representative works that are good examples of the development of media art in Slovenia and present, despite their relatively small number, a varied picture in terms of generation, expression and technological approach. New media department is concentrated on solving the problems related to the conservation and presentation of media art. A comprehensive approach is essential in planing a realistic policy for purchasing works of this type. Aksioma is member of the Association of Non-Governmental Organizations of Slovenia. It's activities are supported by the Ministry of Culture of the Republic of Slovenia and the Municipality of Ljubljana. festivals, followed by theatrical release and television broadcast. real profits and even make a few rich. society that could have a major impact on real society in the future ? affecting the way we all interact. the UC Berkeley Graduate School of Journalism. or KeikoKetsugo@aol.com or in world Keiko Ketsugo. a new reenactment in the frame of the platform RE:akt! Produced with the support of Aksioma - Institute for Contemporary Art, Ljubljana. Synthetic Performances is a series of historical performative reenactments that take place in virtual worlds and videogames. This ongoing project, which started in January 2007, includes reenactments of: Chris Burden's Shoot; Vito Acconci's Seedbed; Valie Export's Tapp und Tastkino, and Joseph Beuys' 7000 Oaks (in progress). For PERFORMA07, Eva and Franco Mattes will stage a selection of three of their Synthetic Performances, including the new reenactment of the performance Imponderabilia by Marina Abramovic and Ulay. 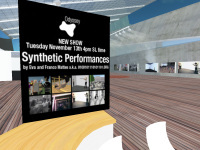 The artists will conduct these performances through avatars, constructed from the shape and surface of their own bodies, in the online world Second Life. 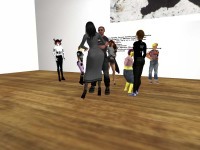 For this event, people are invited to attend the live performances at Artists Space or to connect through Second Life from anywhere in the world. "Eva and I - declared Franco Mattes - we hate performance art, we never quite got the point. So, we wanted to understand what made it so un-interesting to us, and reenacting these performances was the best way to figure it out. We have always been very attracted by things we don't like: Nike, the Vatican or Hollywood crap movies." Eva and Franco Mattes are internationally recognized as supreme interventionists. Most of their projects involve different forms of media hacking and bogus culture trafficking. In one instance, the duo temporarily hijacked the Nike logo for a public installation in Vienna; in another, they created an entirely fictional artist, only to murder him once he was sufficiently famous. RE:akt! - meaning not only "to act again" but "to respond to/react upon" and "Regarding: act! "- confronts current ideological and intellectual canons, power structures, policies, and distribution channels by re-enacting selected historical events. Through processes of analysis, deconstruction, re-enactment and (re-)reporting, the intermedia research and presentation project RE:akt! examine's media's role(s) in manipulating perceptions and creating (post)modern historical myths and contemporary mythology. RE:akt! is supported by the Ministry of Culture of the Republic of Slovenia, the Municipality of Ljubljana and the European Cultural Foundation. Co-production: Moderna galerija, Ljubljana; Maska (www.maska.si); NOEMA. What Robbie Dingo has done is something Akira Kurosawa only envisioned: brought Van Gogh's masterpiece to rich, three dimensional life, and for a brief moment, recast it as a living place. (Brief, for the construction was always intended as a temporary project, "so it's all been swept away now, leaving only the film behind.") But for a breathtaking moment (this is my favorite shot, above) you get to the most iconic of starry nights recast under the rising sun. "One of the challenges was to make it look fluid and simple," Robbie tells me. "If I have got it right, then it should look like something that was thrown together very quickly, but in reality I worked on this in dribs and drabs over a number of evenings." We all know how long it can take a governmental body to complete a project -- Operation Iraqi Freedom anyone? Frustrated with the lack of movement and community involvement with a plan to build a new garden in the central Halles area of Paris, local residents started a competition within Second Life to come up with possible designs for the real world location. While the association knows that the winning design (whose creator won 275,000 Linden dollars) won't be implemented because it doesn't consider real world conditions, they're hoping the competition will put pressure on the mayor to move this project along. It's been in talks since 2004. The main prize went to Joshua Culdesac and Piper Pitney, who's idea included ambitious water features and an ice rink. Smaller prizes were also awarded, including 40,000 Linden dollars to a six-year-old in the children's play area category. According to an article in BBC News: "Some of the participants in the competition spent up to a month working part-time on their entry, says Accomplir vice-president Gilles Pourbaix." O projeto "Arquiteturas Improváveis" faz parte da exposição "Memória do Futuro" e estréia nesta quarta-feira, 04/07, no Itaú Cultural e fica em cartaz até 09/09. O projeto foi desenvolvido pela Giselle Beiguelman e Vera Bighetti com participação de Lalai e Juliana Constatino. 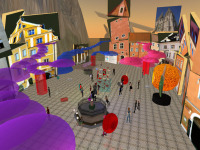 O projeto tem por mote o público como protagonista do processo expositivo e o Second Life como um espaço de horizontes em aberto e sem paralelo no mundo físico. Parte-se dos princípios da endofísica de Otto Roslër, que desembocaram na teoria do caos, para criar um espaço que desafia a percepção dos interatores e reage à sua presença, sendo remodelado e sofrendo mutações estruturais quando visitado e percorrido. Em um terreno no SL, implantamos edifícios de arquiteturas improváveis, suspensas, transparentes e sem colunas, com formatos inusitados que permitem navegar no seu interior e exterior, atravessando as paredes e mesclando-se com a estrutura. Trata-se de ambientes arquitetônicos que assumem “a cara do público”, ao serem modificados pela presença dos visitantes, por meio de mutações em suas cores e testuras que se transformam nossas arquiteturas improváveis..
'Esculturas de imagens’ transitórias, baseadas em materiais líquidos e gasosos, sem portas ou janelas, são um convite à exploração por sentidos emergentes nos contextos dos espaços imersivos. 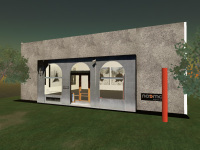 O projeto se desenvolve no SL em três espaços: Itaú Cultural, Ilha Búzios e na Galeria de Arte Digital Noema. Orquestra interativa. Projeto em que diferentes “Huds” ao serem tocados produzem música. A abertura do projeto se deu como um grande happening que mistura realidade e virtualidade. O evento foi transmitido on line para uma Galeria de Londres e vice versa. Noema's 1st exhibition. by Giselle Beiguelman. nowhere/anywhere/somewhere highlights the cinematic experience of space in Second Life. It intensely exploits its resources of zooming, camera movements and ways of displacement in the environment. The visualization resources give/create/invent meanings for the artist's images. Fragments of daily life, captured with a mobile phone, the images in this exhibition are a permanent remix process, rendered by the avatars it interacts with.